Levi and I embark on a rite of passage this morning. I don’t have time this morning to explain much about this trip. Levi and I are headed out for the weekend together. This is his first marker on the road to becoming a man. I’m excited to starte this journey with him this morning. We headed north. We’ll be in the shadow of Mt. Baker. Eating, fishing, hiking, feasting, talking, and whitling. Then we’ll wake up and do some more of that tomorrow. When we return I’ll write a post about the reasons I decided to do this with my sons. In the meantime, if you’re a praying person, think of us often in the next 3 days. The family and I have ventured to San Juan Island. This is our first trip here. My Mom is visiting and we thought we’d explore the Sound more and landed in Friday Harbor. Now on to coffee. Coffee Tour is a bit generous for what I’ll be doing. My best guess is that I’ll only be trying three shops. Since this is a getaway we don’t have much of a plan. My fingers are crossed that I’ll stumble onto some coffee along the way. 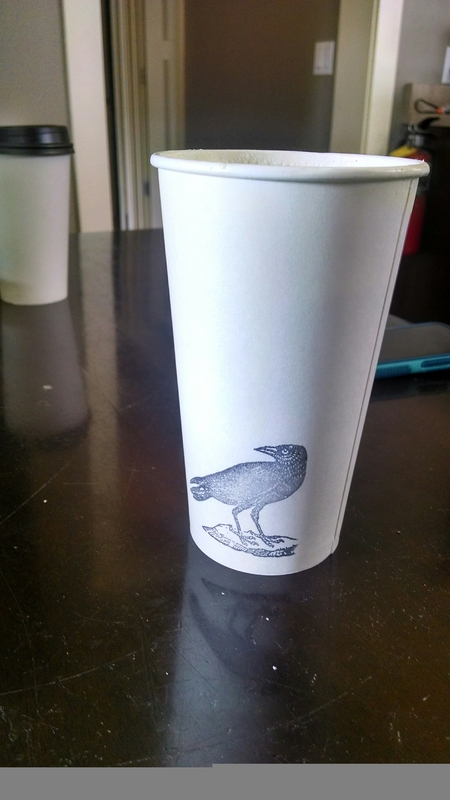 This morning I stumbled onto a gem: The Cow’s Nest Coffee Shoppe. This is a place for locals. Which means I loved it. If you’re not a hoity toity urbanite you’ll fit in too. I’m sure they’d still be glad to take your money if you are. Just know you’ll probably get mocked after you leave. The coffee was well crafted. They get their beans from Seattle. I stand behind that 100% if you aren’t going to roast in house. My cappuccino was great. It was closer to a traditional capp than the pseudo-latte-hipster-cappuccinos you find in Seattle. The people were great. We talked about not needing car alarms and dropping off your kids at your ex-wife’s place hopped up on caffeine. I will darken their door again. We’ve been camping at a state park on the last 4 days. It has been glorious! On the way down we made our way on US-101. We stopped in Astoria to see the Goonies house. We also got some good coffee and checked out some sea lions in the harbor. While we were observing our aquatic mammal friends we picked some berries. It was a great drive southward. We wound our way along the coast through small towns and over uniquely ornate bridges. There were so many place you could stop and appreciate something. We stayed at Beachside State Park. Our site barely fit our huge tent, but we made it work. The cool thing about the coast, at least Oregon and Washington, is there usually isn’t burn bans because its so wet. (The air is so damp your stuff won’t dry.) We cooked over the fire most of the time. It made is slow down and appreciate the conveniences we enjoy at home. We enjoyed being on the ocean. The sand… Oh the “real” sand! It was almost as nice as Saint Joseph, MI. The boys were in for hours day after day. I wish I had a surf board. There great beginner’s waves. I even made a sand castle. That expedience has earned itself its own post. Because of a schelde faix pa our reservation was a day short than we were thinking. We moved north today up to a condo in Lincoln City. We played in the water, including the pool. Now were falling asleep to a Toy Story Marathon. When we get home I’ll add some photos. It’s been a great week. So many gentle and sweat moments with each other. Just the stuff great summer memories are made of. This is my final day. I’ve done well. I’m not surprised that my system needed this. I’m starting back on food part way through today and easing into it the next couple days. I feel more energized than I did 7 days ago. I’ve lost 15 pounds (6.8Kg) as well. I know my appetite has been rebooted. I’m going to keep up the veg and fruit intake. I’ll probably have a juice a day from now on. I’m really glad I did this. I’ll be doing it again. Next time I might go for 10 days. I’ll see how it falls in the calendar. I don’t think it would be wise for me to do this while classes are in session. Thanks for the support during this reboot. I definitely couldn’t have done without community. I’m up, sipping on hot lemon water and a dash of stevia. What? It’s from a plant! I have to say I feel pretty good. The worst day so far was the evening of Day 2. Intense hunger Day 1, and severe headache and fatigue on Day 2. Day 3 I was ok, a little fatigued, but felt good. I’ve heard from friends if you can make it to Day 4 you’re good to go. I’ve decided to go through Monday. That’ll be 7 days. We have a family camping trip that would be on Day 9. I know it that there isn’t ever a “good” time for rebooting, but a 4 1/2 camping trip with the family seems like a really bad time to finish a fast. I’ll be back on solid foods 2 days before we hit the road. I weighed myself. Something I said I wouldn’t do more than once a week while I was in the loosing process. I figured I wanted that information to make my decision on how much longer to go. I’m down 10 lbs this morning! I’m sure I’ll have more to say as I move forward. I will miss you Reader. You’ve been a good friend to me. Gathering all my frivolous blog feeds, that I don’t have time to read much anymore. You even have a wigit for my iGoogle page that pops up when I open Chrome. Thanks Reader, it’s been a good run. To my friends that use Reader this serves as a reminder to export your feeds before Monday. I switched to Feedly.com. On their home page they have a button to import your Reader feeds in anticipation of Reader’s scheduled excision. The Summer Term is drawing to a close. I have an exam tonight, a one page paper, and a 10 page paper due Friday. I’m almost there. I’ve decided that I’m going to keep some discipline up this summer. This decision has come to by a culmination of suggestions from people ahead of me at The Seattle School. Other than exercising a lot, I’m going to exercise my mind. Here are the 3 ways I’m going to keep my synapses firing: Play guitar 3 times a week, read every day, and blog 5 times a week. So after I sleep off this first year of grad school I’ll be jumping into this beautiful summer. We got some rain this morning, but the tent heald up just fine. This was by far the coldest day, close to 25 degrees cooler. Went to a couple good conferences this morning reminding me how God sees me, and how to make better use of my time. Another inspiring worship set. Followed by Don Doe’s encouraging follow up to last night with Romans 8. If Jesus is in us we are co-heirs with him. We are God’s children, and he loves us deeply. How the struggle in our flesh can be overcome with God’s Spirit within us. Jen joined me half way through the message. So nice to have her with us again. That was hollow and inadequate for how we all feel to have her here now. So now we’re gonna find something to roast over the Whisper Lite. Good evening all. The continuing not-so-saga of The Pacific Northwest Association (PNA) annual Camp & Conference. This morning I was able to lead a conference. Let me tell ya, it felt good to teach again. I named it The Art of Discipleship: Retool, Reshape, Revisit Making Disciples. It could have also been named Big-R’s travels. I just shared with them my own journey of discovering rich and ancient disciplines. All of which I’ve used myself, with students and adults. I got some weird looks, and the were a little quieter than I would have like. But on the bright side no one argued with me or left. They were receptive to the “new” stuff. Me and the boys went swimming this afternoon. Joel wouldn’t commit to the cold water. It was cold like Lake Michigan when a storm churns up thrcold water siting down there at 800ft. Graeme and Levi had a ball. Graeme was riding Levi’s bike. Why I don’t know. Somehow he found his way over the handlebars. He scraped up his shoulder and his ankle. I cleaned him up and he’s fine. Tonight another night of inspiring worship. The band (The Vogt family +), shared one of their own songs. I really enjoyed it. Don Doe spoke on the war we fight with our flesh. And how we loose a lot. How Paul did as well. It was good to hear. Again I really appreciated Don’s transparency. Joel fell asleep during the songs. I talking out cold. Levi and Graeme, much to my chagrin slapped him in the face and poked him on the way by to wake him. He woke when the sermon was almost done and he wondered where his brothers went. Its funny because I had asked him 3 times if he wanted me to take him to the kids stuff. He was so groggy, it was lime he didn’t understand English. So I walked him there and grabbed a book to read until the kids were let out. I only read 5 pages. Is was another great day. Tomorrow Jen will come after work. We’ve managed, but its not the same without her. Thanks for still reading this thing. Peace. I fogort to post last night and then my phone died. Worship lead by Vogt’s and company was inspiring again. Don Doe shared about his own struggle with pain and a back injury. He spoke about Romans 5 and hope. At the end of worship several of us prayed for him. I thank Don for his bravery and transparency. After roasting marshmallows over the Whisper Lite I put the boys to bed. Then I went “next door” to talk to a couple I met at the lunch. It was a good day. I’ll post again tonight about today.